"41UR30, A.3.1" by Timothy K. Perttula and Robert Z. Selden Jr. The first vessel is a partially reconstructed Hickory Engraved bottle. It has three widely-spaced horizontal engraved lines on the upper part of the vessel body (cf. Suhm and Jelks 1962:Plate 36c). Hickory Engraved bottle in the Flores collection from the Boxed Springs site. The vessel has a globular body, a flat base, and a straight to slightly constricted neck; the rim is direct with a rounded lip. It is tempered with grog and bone, and the exterior vessel surface has been burnished. 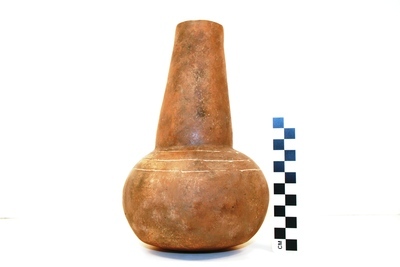 Total height of the vessel is 20.7 cm, and the bottle neck is 12.0 cm in height. The diameter of the vessel along the body is a maximum of 13.4 cm, and the rim orifice diameter is 4.8 cm. At the rim, the vessel walls are 5.3 mm thick.